Man, this book. I DNF’d at 40%, then read so many rave reviews that I convinced myself to soldier on. What if I’m missing out? What if there’s a huge payoff? What if it gets tremendously better in the 2nd half? Nope, should have trusted my gut on this one. I’ve seen it described as “Agatha Christie meets Quantum Leap” — and sure, why not. There’s definitely an Agatha Christie vibe to the set-up. The Hardcastles have invited an assortment of guests to their country estate for a party. Someone will be murdered at this party, and it’s up to our main character to solve the murder. But there’s a twist! The main character doesn’t know who he is or have any memory before waking up on the morning that the book begins. 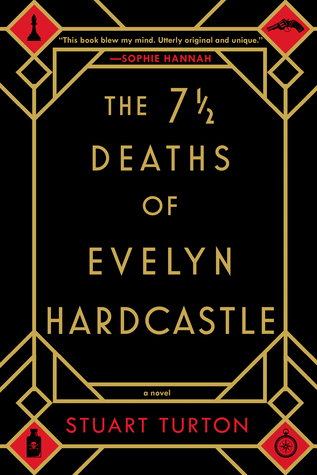 And it turns out that there’s a reason for this — the main character is doomed to inhabit each of eight different people (“hosts”), all of whom have some connection to the Hardcastle family, on a repeating loop. He has basically eight chances to solve the murder as the day repeats itself over and over again, or his memory will be wiped and he’ll start all over again. There are quite a lot of clever bits in the story, and it would take an Excel spreadsheet to keep track of the timelines and all the interlocking pieces of this puzzle. Still, it’s too complicated for its own good, and the fact that the main character doesn’t know himself means that we as readers don’t get to know him either. It all feels like an elaborate charade, and I always felt like a distant observer, rather than getting absorbed by the story or the cast of characters. On a language note, there was a writing tic that bugged the heck out of me: the constant use of phrasing such as “he is stood…” or “it is sat” (as in, the book is sat on the table, or the girl is stood outside the door). What is that? Is that a UK English vs US English thing? I haven’t come across this before, and the repitition of this phrasing throughout the book made me batty. Long story short: Yes, I finished the book. Yes, there’s an explanation for the time loop and the set-up, kind of, although the mechanics aren’t explained and the reasoning behind the situation seems pretty flimsy to me. Having never become invested in the characters, I just couldn’t care very much. 500+ pages is a loooong book for something that didn’t grab me. I’m still not sure what all the fuss is about. He is stood and he is sat is totally a UK thing as some of them speak so. It does mean he is sitting or standing, but they use it this way. I have read many books with same tone of speech. Maybe if I’d been able to read straight through, I might have gotten more swept up in the story… but I assume the things that didn’t work for me still wouldn’t have worked. Oh well, I guess it’s just not for everyone!